Debrina's Altered Art Diary: ALERT! ALERT! The Black and White Zine is up! ALERT! ALERT! The Black and White Zine is up! Ok, I couldn't possibly NOT post this - even though I'm at work with a raging temperature and a throat that feels like the bad end of a hosepipe. 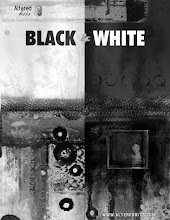 Alicia Caudel's Black and White Zine has been published. This incredibly talented artist and web-designer has pulled it off and performed the miraculous! i am so happy you like it!! 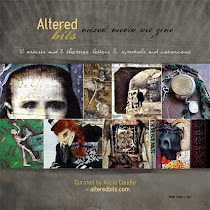 Hi Altered Bits - I have rectified this issue. For some reason, the new blogger picture upload tool is not linking images to sites, which is just crazy, so I'm trying to nut it out. In the meantime, I'l try and disable the picture enlargement. i hope you feel better, sweets! how RUDE of me for not saying anything on that front earlier. i hate being sick and think we have the same bug. maybe all these phone chats? hah! we should trade healing germs on saturday (your sunday). off to finish dinner (came to tell you to feel better mid-meal 'cause i have ADD). A big Hoo-Rah for being published! Fascinating art you've put together there! Мне очень понравилось у Вас, и я написал о Вашем блоге здесь - http://albatravelling.blogspot.com/ . Вы ВЕЛИКОЛЕПНЫ!!! Boyo, that's a tough comment to follow. LOL. I just noticed that you commented on mine, and since it's two in the AM here I was curious as to why I had a comment show up while I'm busy commenting elsewhere. I then realized you're a tad bit off when it comes to time! We do seem to have a few festivals here, but you have to remember this is our late Summer here, and we have the 'Art in the Park' type things when the weather would usually be cooperative. 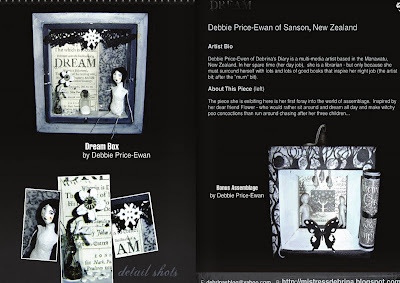 Deb..your assemblage pieces are just fabulous! Like you.. i really like taking my art off the page into 3D! The entire zine looks amazing Alicia outdid herself didn't she?!! Hey Deb, back from my trip and working in the studio, love your assemblage piece and looking forward to seeing the whole issue and of course just love the theme! B&W! Goodness...just woken up from noddy land and look at all these wonderful comments. Is that a Russian up there (? )You're right Mr Cachet...a hard act to follow...BUT you pulled it off anyway, lol! Hi Jo, Caterina and Lisa...thanks for the well wishes...and Jo you get better too! Your pieces in the black & white zine are too fabulous!! Love, love, love them, the assemblage is awesome! I am SO sorry you're sick, please get some rest, take care of yourself - if I were there I'd make you hot tea and toast! Get well, sweetie! 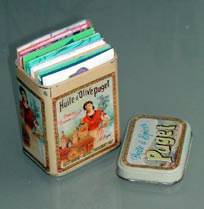 Love the assemblages Deb, both of them! Love the frozen charlottes and the little wire doll from the first piece. Now you know I love text. Where did you find those gorgeous pieces you have used? Did you make them yourself or find them? Love both of them! The dream piece in particular is so fun! Great art girl, Hugs, hope your feelin better soon too! Now how on earth did you manage to pass that bug here as I have it too! Enchanting as always Debrina. Nothing expresses more then black and white. Thanks for these wonderful glimpses inside this zine. Love your patterns, designs, shadows, shades; so captivating! Your pieces are fantastic. Congratulations on being published. Oh you're all so SWEET!!! it was so wonderful to chat again last night, sweets! so sorry my evil-mean phone hung up on you. i really must be thinking of buying a new one before i consider a sewing machine. want to see something amazing? go look at lisa's blog for what she submitted to the MMA challenge. you will fall oh so in love! The zine is absolutely fantastic and I am so happy we were in there together! Your artwork is so cool! Wow Debs!! Impressive work, and the magazine itself is amazing. Thanks for your visit, I appreciate your lovely comment and wishes for well being. I look forward to seeing what you do for the exchange! Wouldn't it be wonderful to end up with one of each others collages! I've just stumbled accross your blog and love it - also, I lived in Wanganui for 5 years! It's a small world. . .
Love what you created for Alicia's zine! I got brave and submitted a postcard, absolutely thrilled to be included amongst so much inspiring artwork!